Copying data from one attribute field to another using ArcGIS Field Calculator? I am standardizing several shapefiles. How do I go about copying data from one attribute field to a new attribute field i.e. would I use the calculate field tool? If the attributes are in different shapefiles then you will have to do a join first. Not the answer you're looking for? Browse other questions tagged arcgis-desktop field-calculator or ask your own question. Computing new attribute based on changes in another attribute using ArcGIS Desktop with Python? Using Python in the Field Calculator, how do I refer to a field in another shapefile? How to Populate new field using expression containing MAX value from another field in ArcGIS attribute table using field calculator? How to calculate/record attachments' file names using Field Calculator? Updating column in Field Calculator using values of another column? 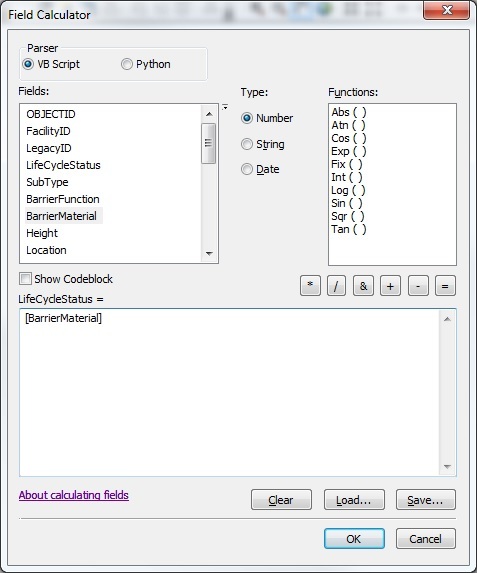 Extracting partial data from one field to another using Python Parser of ArcGIS Field Calculator?